As you can see from the post title, I've decided to join a nail art challenge. It will be every Sunday and will help me keep on track with posting with more regularity. If you want more info, click HERE. 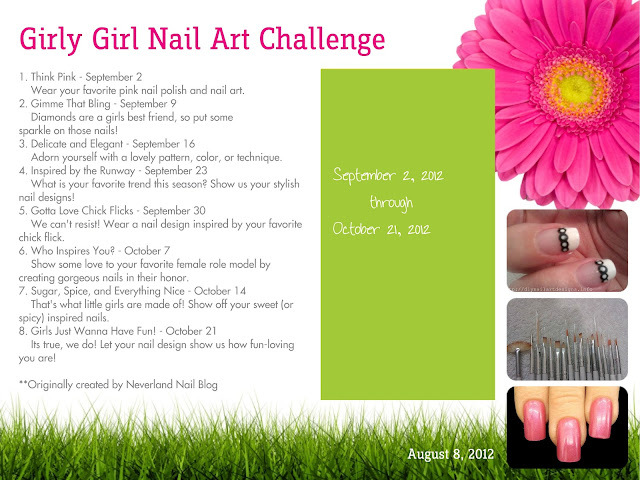 The first challenge is : Think Pink - Wear your favorite pink and nail art. Right now, I'm currently obsessed with ombre, sponge gradients, whatever you want to call them! So I decided to use my favorite neon pink, Soo Nails #170. It is perfect in 2 coats and dries to a satin finish like most neons. Not bad for $1.99? I could've left it at that but I wanted to involve some nail art. I grabbed a cosmetic sponge and decided to sponge on Color Club Age of Aquarius, a mini I received in my first Birchbox. The middle color, you see is the result of the pink and teal mixing. This pic was taken with flash so you can see how eye-searing both colors can be. As you can see, this can get pretty messy. Be prepared to do major clean-up with some nail polish remover and a brush. Or you can use the sponge eye shadow applicators that come with palettes, for a neater job. I tend to use those most of the time because I can buy them in bulk at Ricky's. I liked how it looked alone but decided to use a coat of China Glaze Glacier. Glacier is such a pretty glitter, it's made up of tiny iridescent glitter in a pale white base that had a pinkish duochrome shift to it. I'm so glad I did, it made my nails all twinkly and sparkly. I felt like I was wearing Lisa Frank on my nails. Can't wait until next week! And please check out the rest of the lovely ladies participating! Love the colors you chose! Thank you, it was kinda hard trying to find my favorite pink. this is really pretty....and i like the idea of not worrying about being perfect and cleaning up later. i always try to stay perfectly on the nail and it gets really time consuming! tell me about it... I love how every nail comes out differently. Haha, right? I feel like this is as girly as I get. Can't wait to try the other challenges. I love the touch of the added sparkle! Oooh! Pretty and girly :-) Very sweet! Thanks, love. Ombre's are my new crack, haha. AWWWW I love these, great job! Thanks, this technique is too easy to do! i really like how this turned out! so pretty! Thanks so much! If you give it a try, let me know! Thank you, I'm pretty happy with how it turned out. totally, it reminded me of cotton candy. Thanks, I think Glacier had a lot to do with that, its such a pretty glitter.